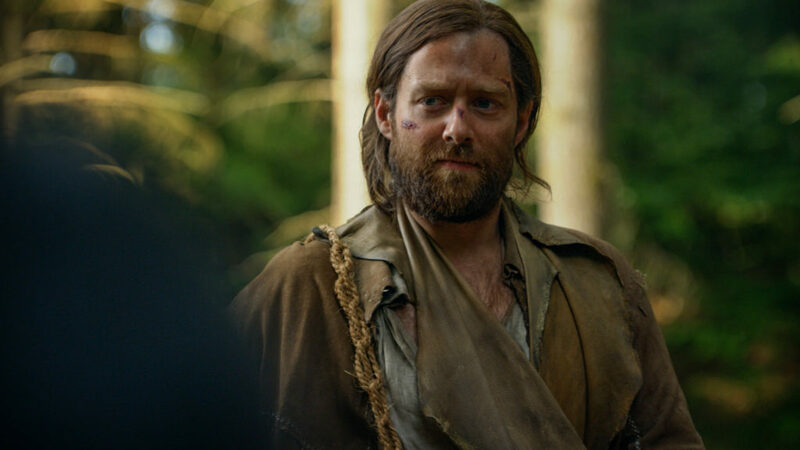 Below are excerpts from new interviews and videos with Maril Davis, Sophie Skelton, Yan Tual, Toni Graphia, and Richard Rankin about Outlander episode 412, “Providence.” Be sure to click on the links to read the full interviews. Since these posts/interviews follow the latest episode, beware of spoilers and there may be a discussion about storylines in future episodes. Richard Rankin: No, I don’t think so. It’s the opposite. That whole speech he gives to the father, he’s going through a little journey of self discovery, He’s seeing all these things for the first time and he’s recounting everything he’s done that’s led him up to this point and how it could have been different. In terms of his choices, especially about Brianna (Sophie Skelton), they could have been different. But at the end of the day, his choices have and always will be for love because of how deeply he feels for Brianna. He’s giving the Father this talk about how he’s going to be selfish and start looking out for number one… but I think what he’s doing is an act of self-preservation. The irony is that, after this massive speech — which was beautifully written — he escapes and then completely contradicts everything he’s just said to the Father. He runs back. No, I don’t think there’s an ounce of selfishness in Roger. I think it’s completely indicative of the character to run back. I didn’t even have to read that part to know he would run back. There’s quite a heroic, compassionate part of Roger. He’s always going to try and help and do something about a situation. I think the first glimpse of that part of him you see on the Gloriana when he steps in and helps the mother and baby. He has a strong moral compass that just grows and grows throughout the season. Not entirely. Roger’s never going to be that historian that we knew of. That guy is long gone. There’s definitely going to be a hangover of what happened for a long time, if not forever. I think that’s fascinating as an actor to play. He’s a deeper, more complex character which is more interesting for the fans to watch. Roger and Brianna were more front and center this season on Outlander. How has that changed the experience for you? We filmed more; we are doing more work. I don’t know how much I really view that as a change of experience. Obviously, being more invested in the show and being more involved in the show is very exciting, it was something we had been looking forward to, something we had been very excited about because we had read the books. We knew the outline of season four; we knew that we were going to be in it much more. We knew that we were going to be more front and center come season four and season five. I think, in a lot of respects, that’s something that I was holding out for was the story in season four and that arc. Don’t get me wrong. I loved the stuff in season two and in season three, but we, obviously, weren’t featured quite as heavily and we didn’t have as strong a running narrative in season two and three, as we do in season four and, obviously, it’s a very important plotline, if not one of the main plotlines through season four. So, it’s been a lot of fun to play and be much more part of the integral storyline. Roger was really put through the wringer this season, physically. Do you enjoy the physical acting challenge or would you rather be doing more internal emotional stuff? I like doing both. I like doing a range of things because the more you have to get into, it keeps it different, it keeps it versatile, and, as actors, we need to demonstrate our versatility. You can’t really ask for much more as an actor than to be put in a position to demonstrate as much of your range as possible. So, doing both the internal, the emotional stuff, and playing the scenes for everything I can get out of them is what I enjoy doing. The physical stuff is great as well. It’s a big change, obviously, for the character. What we’ve seen him do is not normally the light that we see him in, so it was a lot of fun. It was a big challenge and, obviously, it was very repetitive in terms of the physicality over several episodes, so it started to take its toll after a while. I was tired by the end of it, but I felt like it was very worthwhile and we got a lot out of it, so the end result was worth it, I think. I imagine every actor wants at least one scene in their career that’s worthy of “Adagio for Strings.” When did you find out that song was being used, and what was your reaction? [Laughs.] I love Roger so much. I love the fact that he even has this debate with himself. Because you know he’s gonna. He’s a man of such compassion. Hearing someone in such pain and anguish, he has to step in and do something. He just thinks, I’m gonna try to help him, somehow. More than likely it’s gonna lead to my own demise in some respect, but I can’t not. It’s almost like he’s pulled from the soul toward that, to try and help the man. This is just how he is. These are people from the ’60s and ’70s, when people behaved very differently. And these characters, they aren’t even particularly indicative of their own time—Brianna is much more modern. She’s ahead of her time, and Roger has maybe one foot in the past. I think a lot of people are looking at their relationship through a modern lens, from a 2019 perspective, and judging it from there, when in actual fact, it played out how I would have expected an argument between the two of them to play out. In the books, there’s a story thread with Lord John and the guards at the prison that’s never explored on the show, so that’s why the producers decided to take the escape scene in a different direction. “We also wanted to end this on a little bit more of a cliff-hanger on whether or not Bonnet lives or if he’s killed in this explosion,” Davis adds. “As we’ll come to see, Roger doesn’t really believe what he’s saying,” Davis says. “He’s trying very hard to convince himself, and I think that’s what is so interesting about Roger — all of our characters — [is they] have flaws and are human, but Roger is such a nice guy. Some people have reacted negatively to how he’s been portrayed earlier this season because he came off as misogynistic and mean to Brianna, but he is a product of his time. The guy truly, deeply loves Brianna. He’s gone to the ends of the earth to try and get her back and has the best intentions at heart. Tell me about that final scene, and Alexandre’s choice to face death. What was it like filming that day? Sources linked in the post. This entry was posted in Interviews, Maril Davis, Richard Rankin, Sophie Skelton, Toni Graphia and tagged Interviews, Maril Davis, Providence, Richard Rankin, Season Four, Sophie Skelton, Toni Graphia, Yan Tual by Sarah Ksiazek. Bookmark the permalink.